This is an easy-to-make chili that'll make you feel like a cast iron pro. You can use your cast iron dutch oven, or an enameled dutch oven if that's what you have on hand (bare cast iron is preferable since it allows for the development of fond, which improves flavor). This chili accommodates a variety of meats and beans, but more importantly it's very tasty. This recipe solves both problems. Heat your cast iron dutch oven on medium heat, and add 1 tablespoon of oil to the pan. When the oil is hot and shimmering, toss in your onions and celery. One of the keys to developing flavor for chili is to pair sweetness with salt. The sweetness comes from caramelizing your onions before adding liquids. Because the onions and celery will continue to cook as the meat browns, I like to give them a 5-6 minute head start. Stir the aromatics around as they cook to avoid scorching, and then add the ground meat. Brown the meat, stirring every minute or two. This will take around 10 minutes. Once the meat is browned, add another tablespoon of oil, 1 tablespoon of kosher salt, 1 teaspoon of black pepper, and the flour, chili powder, and granulated garlic (NOTE: I use kosher salt because it's what I have in a bowl next to my stove. If you're using table salt, cut quantities in half). Cook the spices (in the meat and aromatics) for about a minute to release their oils, and then add the beans, diced tomatoes, and bay leaves. Stir things around once more, and then simmer on low heat for 30 minutes to 3 hours—depending on how hungry you are. Stir it every 10 minutes or so while is simmers to avoid burning. The longer it simmers, the better. As your chili simmers, taste it! You want the beans to soak up as much flavor as they can, since this makes each bite of chili more balanced once it hits the spoon. As the beans soak up flavor from the surrounding liquid, you'll want to add more salt and seasonings. If the chili doesn't delight your palate with flavor upon tasting, add salt until it does. If you prefer more heat, add black pepper (NOTE: pepper takes some time to release into the dish, so wait 20 minutes after adding pepper to taste for heat). If you'd like a little smoke, add a smokey hot sauce like Uncle Brutha's (which, of course, will add heat, too). As mentioned above, you'd be silly not to serve this chili with some cast iron skillet corn bread. We like to put it over noodles or rice, and it's best served with fresh chopped onions and grated cheese. Scrub your dutch oven clean with a non-abrasive cleaning pad and hot water. If you don't want to dirty your sponge, or if your sponge is full of soap, you can use a plastic mesh produce bag (like for onions or citrus) and throw it away when you're finished. Once clean, dry your dutch oven with heat on the stovetop or in the oven (on 250 degrees F). Once it is dry, oil the dutch oven all over and let it cool. Cast iron should always be put away shiny with oil! Read more on the care of cast iron cookware. I used a 5 quart dutch oven for this recipe. You can see the measurements of that dutch oven here. As you can see from the photos, there's probably just over a quart to spare. If your dutch oven is really 4 quarts, I'd probably cut the recipe in half. Thanks for the recipe, I just made this tonight to break in my new Lodge 5QT dutch oven and the chili was delicious. We ate it after an hour of simmering and it was pretty good. After adding a little more chili powder, salt, and garlic, and letting it simmer for another two hours, it was amazing! I used mostly the same ingredients, except for low sodium canned black beans, and a mix of 1 lb ground turkey thighs and 1 lb grass-fed beef. I was worried the low fat content of the beef and turkey would make this dry out too fast, but I followed the same directions and it turned out fine. Can't wait to try out your other recipes! Glad it worked out! Nice work on the seasoning adjustment by taste... that's the key. Let me know if you have more thoughts/tweaks to any other recipes you decide to try! Great question! Adding that info to the recipe now, but in the meantime, this recipe makes 16 cups of chili, which should safely serve 8-10 people. I mean absolutely no disrespect, as this recipe is delicious by itself, but for those looking for a somewhat richer, or more Mexican tasting chili, a great spice to add into this recipe is cumin. It's a little more subtle than the Chili powder, so I'd go maybe two tablespoons. No offense taken whatsoever. I agree that cumin is a fine addition, and depending on my guests, will add it on occasion. Thanks for chiming in! I am looking forward to trying this recipe out tomorrow on my Cabela's 12 inch dutch oven. -It would also be helpful to know how many charcoal briquettes for outdoor cooking you would recommend to achieve the 350 degree cooking temp. Just my two cents...cannot wait to try out the recipe. Thanks for your comments! I also wish the printed versions of these recipes were better. Unfortunately, I am somewhat at the mercy of the Blogger template system. I'll see if they've made any changes on that front that I can take advantage of. For a 12-inch dutch oven, stewing, and 350 degrees, his suggestion is: "Place 6 briquettes on lid and 18 underneath"
I Cooked the chile recipe and it was awesome. Not too runny and full of flavor. It easily serve 6 adults with a handful of kids and they all gave it 2 thumbs up.. Added a S. Africa Smoke spice (trader joes) for some extra favor and seemed to work out well. Thanks for the briquette calculator...that came in very handy. Glad to hear it went well! Two thumbs up is always good. Made this while camping last week - 1 and a halfed the recipe. Simmered it for 2 hours. Added a tad of brown sugar to complement the spice. It was gobbled up in 15 minutes by 8 people. Wonderful recipe. Thanks. Thanks for reporting back in from the field! Great to hear that the recipe was a crowd pleaser... with your additions, of course. I don't think I've ever actually followed a recipe... and all of my recipes are intended to be a starting point. Would this recipe work using a new Lodge Pre-seasoned dutch oven? We just got an induction cooktop and I am thinking of going with primarily cast iron for our new cookware. However, I'm 100% new to cast iron cooking, and am wondering how seasoned I will need to get my various pieces before my meals will start tasting good and my food will not stick. I'm especially concerned with this recipe, due to the acidity of the tomatoes. Thanks for this blog and all the recipes. I'm excited to start cooking with cast iron. I'm hoping the husband will buy in as well. He's a bit skeptical. However, since we need new, induction compatible, cookware anyway, I'm really hoping to steer clear of non-stick pans from now on. I know there will be a learning curve (for example, I used my new 6 1/2" skillet to cook eggs in this morning and boy did they stick), but I think in the long run, it will be worth it. I have an induction glass top, and cast iron works great on it. I think you'd be fine with this recipe on a new pre-seasoned dutch oven. Ideally, you'd get a chance to do an oven seasoning first, but if not, I still think you'll be OK. Same for the egg skillet. Hope that helps! Thank you so much for the recipe, I just won our company's Chili Cookoff. hi there great recipe. Do you drain the fat off the beef after it is cooked? I do not drain the fat, but I also typically use bison, which runs pretty lean. The added flour combines with the fat and makes something of a gravy to thicken the chili... so you definitely want some fat after browning. In this recipe I actually add oil after browning rather than pouring off fat. I'd guess that if you're using beef that's 85% fat or more, don't add that last tablespoon of oil. If the beef is 80% fat, you may need to drain some of the fat. Thanks for posting this recipe, I entered it in my churches chili cook-off. I didn't win, but i had several people come up to me and tell me how much they loved it. For the beans, I used one can of kidney, one of pinto, and one of chili beans. I also added 1 small can of Rotel tomatoes and green chilies. It was great! Glad to hear you got good feedback from folks at your church. I like your tweaks to the recipe. I don't know that I've ever made exactly the same batch twice. Thanks for sharing! When the chili is simmering, should it be covered? If you're going to simmer for more than an hour, then yes, I'd go ahead and cover it. Make sure to check it frequently for any signs of sticking or burning--especially on an electric cooktop. Cooked this for our 8 ASM's Saturday evening after our Boy Scout troop's vigourous day on the mountain bike trails near the New River State Park in Virginia. Everyone was raving about the recipie. Only thing left in the oven was some gravy. The briquette calculator you referenced in the corn bread comments was accurate. Glad it worked out! Thanks for the comment. Yes! You can use canned beans, or you can start with soaked dry beans and cook them yourself. 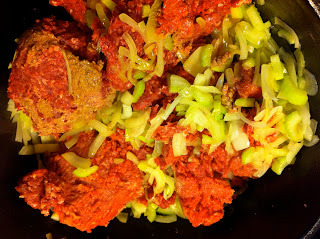 The important part is that they are cooked and soft when you add them to the chili (and not dry/uncooked). Hope that helps! I followed this recipe step by step just as instructed. I made this for the first time last month. I couldn't believe how well this turned out. The flavor, the sweetness from the onions & celery, moistness, and it needed (0) salt afterward! I had my doubts because celery is my least liked food, but now I will be using it more often. I made my 2nd batch just last night. This time I added a tablespoon and a 1/2 of granulated sugar, and the same of dark brown sugar. That was just enough to give it more a noticeable hint sweetness, however, I'm going to stick to the original recipe next time. Great job on this. Thanks from the wife and myself!